Your Rising Sign, otherwise known as an Ascendant, is the Zodiac Sign that was rising on the eastern horizon at the moment you were born. 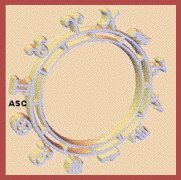 It can be abbreviated on a birth chart as ASC or AS. When you know the time you were born, your Ascendant Sign can be calculated to the exact degree. It is believed that if the Ascendant falls closer to the beginning of the Sign, the stronger the effects will be felt in the individual. This is also held to be true if the Sun is in a weak position in the birth chart (such as if the individual was born at night). Its also thought to be weaker when the individual is born towards the end of the Sign's Ascendancy, just before the next Sign appears. The Ascendant is said to be the mask one wears in public… it is the first impression we make when we meet new people. Often, if you are confused at how others have described you, it is because they are describing this aspect of your personality. The Ascendant takes part in your appearance and personality, going as far as influencing physical characteristics sometimes. The Sign becomes expressed in your image, style and mannerisms. It is also expressed in how you act. Some astrologists theorize that the Sign becomes weaker after a person reaches 30 years of age, as their confidence grows in who they are. it responds to your environment. Your Sun Sign gradually becomes more noticeable over time. The two Signs will eventually blend, creating an outer layer and an inner layer, enclosing the Moon Sign deep inside. Like other Signs of the Zodiac, Rising Signs fall into fire, earth, air or water categories. Fire Signs like Aries, Leo and Sagittarius appear energetic, optimistic and enthusiastic. They usually appear friendly and non-critical, and they generally do well with others in social gatherings. Earth Signs like Taurus, Capricorn and Virgo come off as practical and secure. They may appear a bit shy, or cautious and serious. Air Signs like Gemini, Libra and Aquarius are good at communication. They are perceived as sociable and friendly, if a little independent or detached. The Water Signs of Pisces, Scorpio and Cancer are seen as emotional, intuitive and feeling. These people will usually hide their true feelings and feel a need to protect themselves from the world. How they present themselves to the world is done for effect so they do not feel they are at risk. Find your Rising Sign using our free Rising sign Calculator. Exact birth time required.